It would be a mistake to dismiss the three-match Twenty20 series at the end of this unpredictable tour involving Pakistan and England as inconsequential. It is nothing of the sort. Twenty20 might be anathema to some but the size of its audience is undeniable. There is a World Twenty20 in Sri Lanka in September to plan for and these matches will be vital preparation for both sides. There has been little logic in what we have seen so far in the other two formats. England, ranked as the No. 1 Test side in the world, were trounced 3-0 in the Test series; with little reputation in the 50-over game they responded by returning the favour with a whitewash in the ODIs. Add the fact that T20, if not the lottery many claim, is more unpredictable to call, and only a fool would be confident of the outcome. England turn to their third captain of the tour with Stuart Broad stepping up for T20. It is testimony to their unity that they can make the transition between captains with no sense of discord. Pakistan will soon be considering a replacement for Misbah-ul-Haq and a young T20 captain would be one way to begin their rebuilding process, but the captaincy triumvirate might be one English export that never takes hold. Awais Zia, a dashing left-hander, gets an opportunity as Younis Khan and Azhar Ali return home. Zia, 25, from Chakwal in the Punjab, has even been called "the new Boom Boom." No pressure there then. The player the English media wants to watch is Alastair Cook, whose flowering as an ODI batsman has been followed by his addition to the T20 squad. "Injury cover only," insist England nervously, whether because they are frightened of undermining Broad, have no intention of playing Cook, or are being strangely playful, who can tell? Team news is patchy. 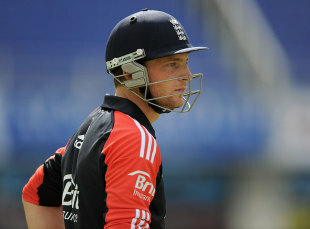 Broad admitted that England had injuries and then refused to say what injuries they were, encouraging more Cook Fever. Ravi Bopara's bad back may rule him out although he trained on Wednesday. Pakistan will play Awais Zia but the presence of Hammad Azam, overlooked for the ODIs, ahead of Imran Farhat is less certain especially as Misbah has expressed the wish for those who failed in the one-day series to make amends. Pitches in Dubai have offered enough pace to encourage strokeplay so the odds are on a high-scoring match. Temperatures in parts of the UAE fell as low as 9C in mountainous areas, 12C on the coast, on Tuesday with storm-force winds, sandstorms and rough seas. Awais Zia is uncapped and the only new face in Pakistan's T20 squad. Broad has missed three of the six Twenty20 matches since he was named captain due to injury. Mushtaq Mohammad, the former Pakistan captain, has called for Pakistan's one-day side to be dismantled. "No reassurances needed to be given. We've worked closely as three captains, as we have done for nearly a year now, and that doesn't change overnight." Stuart Broad, England's Twenty20 captain, less concerned than the media about the addition of Alastair Cook to the squad. "Sometime you feel home sickness. It is not that I'm giving an excuse on this matter but it happens when you are not playing at home." Misbah-ul-Haq, Pakistan's captain, reflecting after the 4-0 defeat in the one-day series upon a home series that is nothing of the sort.